As described earlier Baroda State had its own arrangement for government correspondence, which continued till 1878. It seems to have been the practice for British authorities at Borsad in Kaira district to frank the post of the Gaekwar Sirkar sent from Pitlaud (Petlad) even prior to the date of establishment of postal system in Baroda territory. How this practice arose does not appear. Also from former times The Gaekwar Government enjoyed the privilege of sending mails to the Durbar Vakils (advocates) at Poona and receiving the same from them free of charge under the frank of the Resident and the agent for Sirdars in the Deccan respectively. On establishment of British Post Offices in Baroda territory, the Government of India agreed for the refund of expenditure incurred by the Baroda State Government on account of postage to be used on state correspondence as per conditions specified in the memo of Baroda Residency dated 14.10.1863. The Resident at Baroda paid these expenses from his treaty. In 1879 the British Government revised the rules for regulating the use of Service postage stamps by native states and brought them in to force from 1st November 1879. By this arrangement His Highness' Government were allowed to use Service stamps on State Official Correspondence. Officers of HH Government of Baroda were accorded privilege of franking letters using Service Postage Stamps to be posted with in the limit of the state itself. An intimation of any addition to the list of officials as well as the locality where in the franking should be recognised had to be given to the British postal authority. Adoption of this system was advantageous as the letters weighing up to 10 tolas could be sent for one anna under Service Post, where as private letters exceeding ½ tolas and not exceeding 1½ tolas were sent for one anna. On 3rd January 1906, Director General of Post Offices of India authorised certain officials of the Baroda State to use Service postage stamps on the official correspondence and to post such correspondence under their frank at all the Imperial Post Offices in India. Under the official correspondence rules, unstamped or Service bearing letters were not allowed. Also the state correspondence using Service stamps were not allowed to be mailed at railway letterbox or RMS van. A letter mailed at RMS Letter Box in October 1891 with Service stamp of one anna was disallowed and two annas were charged as postage due with a remark "Posted in RMS Letter Box contrary Director General's Orders." In 1907, The DG of Post Offices of India issued a notice by which the rates of postage charges in respect of both private and official letters and parcels were assimilated with effect from 1st October 1907. The native states using Service stamps had from that date no concession, which they had hitherto enjoyed. The Baroda Government opposed the new change and any other alternate to the concession was requested. In April 1909, Government of India sanctioned a free grant of Service postage stamps of the value of Rs 36000 per year and subject to revision after five years. In April 1914 the grant was increased to Rs 40000 and in 1919 it was raised to Rs 85000 per year. In the event of the State requirement exceeding the amount of free grant, the additional Service stamps were to be purchased by HH Government at face value from the Residency Treasury. Here is an example of printed envelope with 'ON H.H. THE GAIKWAR'S SERVICE ONLY' inscription, bearing King Edward VII, half anna stamp, overprinted with "ON H.M.S." addressed to Ajmer mailed on 31st July 1909. 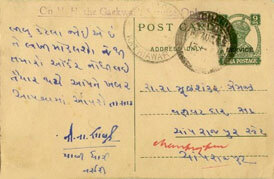 An envelope bearing King George V Service overprinted stamps mailed from Dwarka by the Court of Baroda State to Morvi on 21st March 1924 bearing text in Gujarati "Only for use of Gaekwar Service" is also shown above. A Service postcard is noted here, with rubberstamped inscription "On H. H. the Gaekwar Service Only". The card is sent by In-charge of Dhari Nursery from Dhari to Champrajnagar on 14th August 1945. Another example of Service postcard is with the rubber stamped inscription "ON BARODA STATE SERVICE ONLY", mailed from Amreli to Veraval on 23 Jan. 1945. British Authority also restricted use of Service stamps for official foreign correspondence. Baroda Government made representations to British authorities but permission was refused. Ordinary postage stamps were used by the state for foreign mails under protest for some time. However Mr DC Padgham reports one cover, with King Edward VII (overprinted 'On H.M.S.') adhesives dated 6 October 1910 addressed to Germany. The Service stamps were accepted, although the agreement restricted them to inland use. In another example a printed envelope, from the "Superintendent, Furniture Factory, Baroda", 'on H.H. 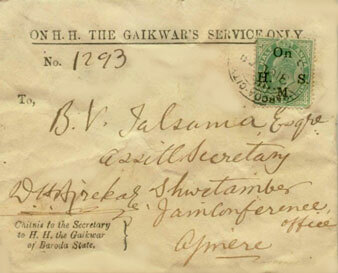 the Gaekwar's Service' to London posted at Lehripura (sub-office of Baroda) on 14 September 1933 was prepaid with ordinary Indian postage Stamps, in observance of the agreement. Similar known example is of an envelope from Baroda State Press to Sagaing (Upper Burma) registered from Baroda on 27th December, 1932 prepaid with ordinary stamps without any inscription of Service postage. An attempt to use Service stamps in 1914 on a letter to USA was illustrated in India Post 133, but here the stamps were disallowed and the letter was taxed 10 cents on delivery.